At Connecticut’s best mini golf courses, you’ll find tricky obstacles, creative themes, and plenty of fun memories to be made. Think you can get a hole in one? Work on your short game at one of these 10 awesome courses in the state! Open since 1985, Safari Golf has been wowing families with tons of hole-in-one fun with their jungle themed mini golf course. This 18-hole course features model animals, a cave, and even animal sounds to really give it a unique feel. With affordable prices and the option for a free game with a hole in one on the 18th hole, this is an excellent course to play anytime. Be taken on a trip through Switzerland with an 18-hole game where players will learn about cheese, chocolate, and the Matterhorn. This internationally inspired course allows for family fun and even offers occasional competitive (for fun) tournaments. Discounted replays are also available for hours and hours of put-put fun. Sonny’s Place is a large sports and recreation center with activities for the whole family. With an onsite restaurant and ice cream shop, there is no need to worry about packing lunch. Sonny’s has an 18-hole mini golf course with water features and tricky obstacles to beat. 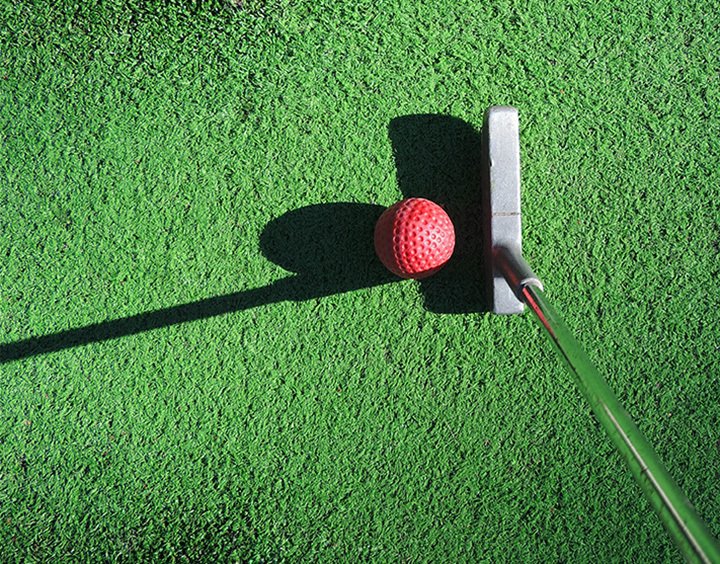 Head on over to Farmington Mini Golf for a game of put-put on their nicely tended course. This scenic setting creates a great game of golf for families, friends, or couples. Also, an annual mini golf tournament is held each August, proving to be tons of fun for both players and spectators! Enjoy a picturesque round of 18 holes at this beautiful mini golf course that features koi ponds, waterfalls, a cave, and beautiful landscaping. Hidden Valley offers affordable prices for the whole family and discounted replay rates. In addition, they have a large play area for kids and batting cages. Head indoors on a rainy or too hot day for a chilling game of Monster Mini Golf. Eighteen thrilling holes are played on a glow in the dark course and unexpected challenges lurk around every turn. Do you dare make a hole in one? Torza’s golfing complex features a mini golf course with a unique twist on mini golf using cards dealt to each player. In each round, players can use these cards to modify their game and create competition with other players. For a very different type of mini golf, Torza’s shouldn’t be missed. Open until pretty late, Old Sawmill Grill & Golf Course boasts a scenic course with well-maintained greens. Obstacles await your ball and enhance the game. The on-site restaurant features yummy grilled and fried foods as well as ice cream—perfect for a post par treat! If you are in the area, Berlin Batting Cages offers mini golf enthusiasts two courses full of challenges. The Fun Course features traditional obstacles such as a windmill and bucketwheels, and the Challenge Course catches up your ball with rock traps and other tricks. Berlin Batting Cages also has batting cages, bumper boats, and a raceway on-site. Enjoy a traditional mini golf course and driving range at Mar-Lea. Here, players will encounter windmills, tunnels, and other obstacles that were standard in vintage mini golf courses. The value for money at Mar-Lea, however, can’t be beat.